How to install an outdoor patio roof | Garden roofing made easy. TIP “For a high wind zone ort over 8 metres off the ground nail the entire sheet every 150mm. This is called storm nailing and will conform to most plywood manufacturers guidlines”. Anything over 2 metres in height is considered “Working at heights” and certain safety measures need to be taken (refer to Work Safe Guidelines). This is a 600mm wide aluminum scaffold that is very lightweight and portable. This is a full roll of asphalt Saturated felt material that is used to cover the entire outdoor patio area. One of these rolls covers 40m2 – however you will loose some area in the overlap. The use of the felt paper gives the entire system a Class A fire rating – Resisting severe exposure to fire. It also protects the asphalt shingles from toxins leaching out of the plywood. 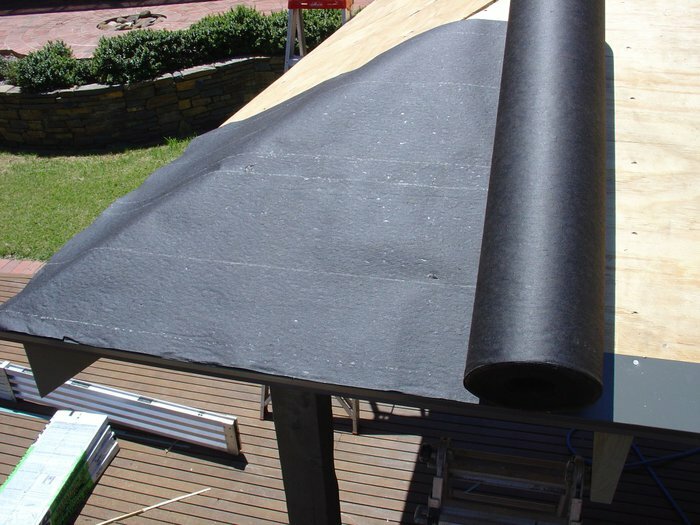 Roof felt paper provides added protection against severe wind driven rain and reduces the instance of picture framing which is the visible outlines seen when the plywood is not perfectly flat. Lay the asphalt saturated felt material across the roof starting at the bottom. The bottom edge of the felt paper should be in line with the bottom edge of the drip edge. When joining you should overlap 100mm on the vertical joins and overlap 50mm on the horizontal joins. Staple the paper down to hold the felt paper in place. When it is windy it is useful to have someone to help as it is hard to keep the paper in place.